This is what I do with my cardoons, which grow all over my yard, uncontrollably. If you’ve never heard of them, cardoons, Cynara cardunculus, are a relative of the artichoke — only you eat the stalk, not the flower. They taste like a cross between celery and artichoke heart, with a little bitterness thrown in for good measure. The texture is like burly celery. I’ve grown cardoons since I moved to California years ago — or, more accurately, cardoons have taken hold of my garden ever since I planted that first one. If you let them bloom, a cardoon is a majestic plant with a flower stalk that can grow 10 feet tall. Once those flowers fade, they send out hundreds of seeds on parachutes that fly all over your yard. This is a good thing. I let a few live each year, and those that are settled in the garden are perennial. I get two crops, one in spring and one in fall. The spring one is better, as the stalks are less bitter then. Actually eating these giant thistles can be a bit of work. I learned my method for prepping the cardoons from Paula Wolfert in her Mediterranean Grains and Greens, a hard-to-find yet excellent book. If you can get this book, you will not be disappointed. In it, Wolfert goes into some of the deepest lore on unusual grains and plants eaten in the region. Fascinating. Finding cardoons has become much easier in recent years. I’ve seen them in Whole Foods in early spring, and any good Italian grocer will be able to get them. In Italy, they’re often called gobbi, the hunchback. And, as you may have guessed, cardoons grow easily from seed. Serve this as a vegetarian dinner, or as a side dish for, say, osso buco or pot roast. You need a huge cardoon to feed four, as you cut away the tops of the plant and pick off the outer ring of stalks, which are always punky and bitter. Look for stalks with a white bloom on them that comes off when you rub it with your fingers. 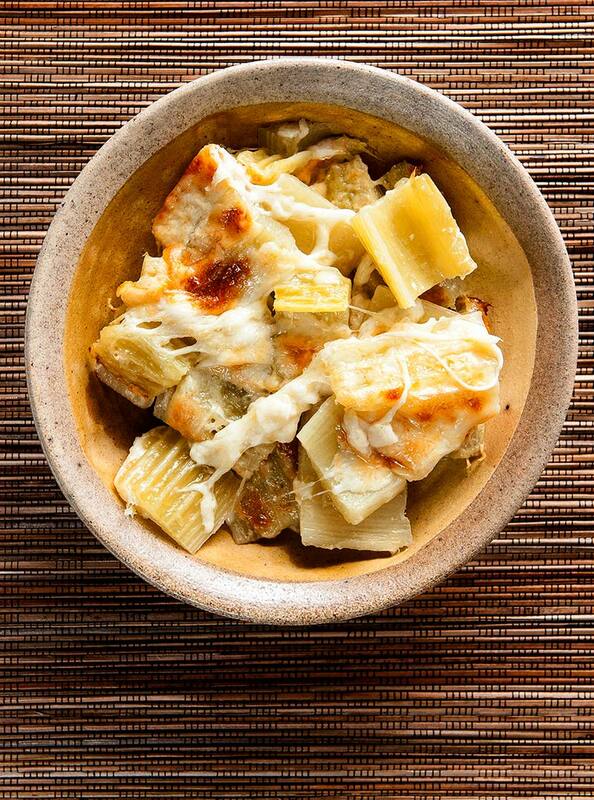 In stores, cardoons are typically pre-cut and trimmed, so you can use whatever you buy. Bring a large kettle of salty water to a boil and preheat the oven to 400 degrees. While the water is heating, use your fingers to zip off the little strings on the ribs of the cardoon stalks. You don’t have to get them all, just do your best. Don’t dig too deep or you will break the stalk. Juice one lemon and pour the juice into a large bowl of cold water. Chop the cardoon stalks into batons of whatever length you like; I like 2-inch batons. Put the cut cardoons into the lemon water to keep them from discoloring. Toss in the cardoons and boil for 40 minutes. Smear olive oil or bacon fat all over the inside of a casserole just large enough to hold the cardoon pieces in one layer. 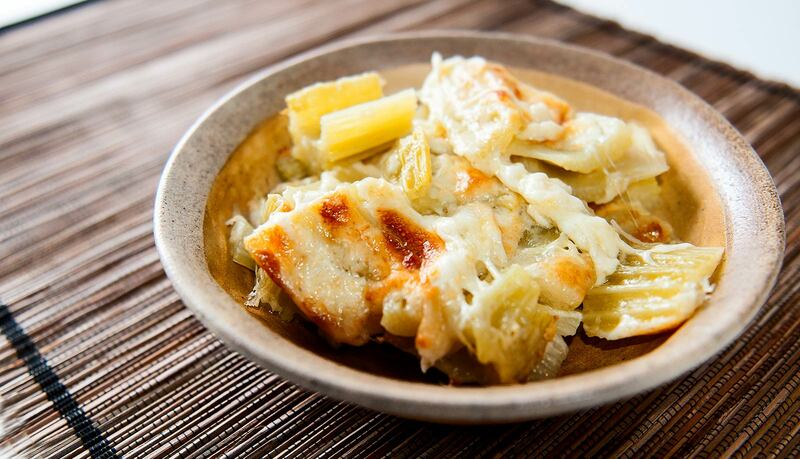 When the cardoons are done, arrange them in the casserole. Sprinkle over the mozzarella, then the pecorino. Bake for about 35 minutes, or until the cheese begins brown. Serve with a wedge of lemon and freshly ground black pepper. Eat this with a malty beer or a shot of grappa or ouzo -- it's not a very wine-friendly dish. 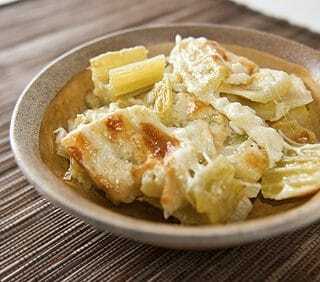 I chop white center parts of cardoon in wedges like celery and use in a vegetable soup, wonderful addition towards the end when they will get just a delicate softness and add a savory depth to the vegetable soup. Everyone wonders what it is. Also great chopped same size & added to peas, butter & thyme. I also freeze, 30 second blanch first. I am looking forward to trying your gratin recipe, but i’ll use newspaper or papertowel cardboards to blanch as they grow to avoid bitter green. I’ve also noticed they sell in healthier stores here in SB, early October but charge over $4 lb. My friend’s grandmother used to fry them, she called it “gardoona” and told us it was the stalk of the artichoke. I never knew what it really was until I made the connection a couple of years ago while flipping through a seed catalog. I finally planted a few in my flower garden this year and I am very excited to try to cook with them. How many stalks should I use for your gratin recipe? Do you know if the stalks freeze well once they have been boiled with lemon?